The popularity of Maxis’ 1989 classic SimCity allowed the American developer to take their flagship brand in new directions. Clearly trying to replicate the success of SimCity, between 1989 and 2000 fifteen different titles under the ‘Sim’ banner were released. One of the more successful endeavours was SimTower, praised for being “homelier and more personal” than past games. If you were a fan, then you’re in luck. If Cities Skylines is the spiritual successor to SimCity, then Project Highrise is the modern-day equivalent of SimTower. The concept is as simple as can be: construct and manage a towering skyscraper, allocating spaces for offices, apartments, shops and more, all while making sure existing tenants are kept happy and hooked up to the power and phone grids. Only basic facilities are available to begin with, but as the reputation of your tower grows, more lucrative offers come your way. 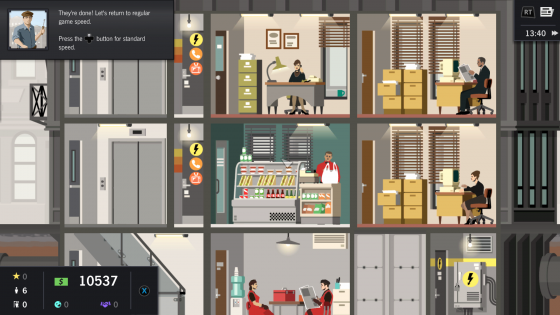 Thankfully, Project Highrise doesn’t force you to manage dull office blocks (and if that is your thing, we aren’t ones to judge). 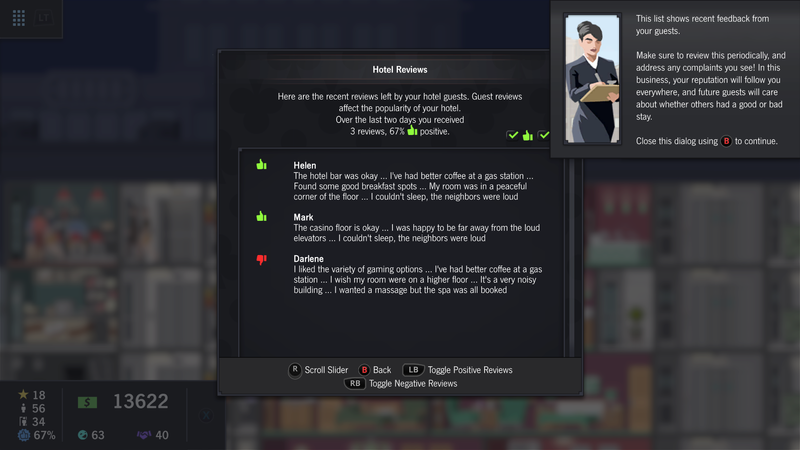 This is a content-heavy GOTY edition of sorts, packed full of add-ons that allow you to turn your tower into a casino, hotel, party venue, or a bustling business centre. All of these can be supported with additional services, some of which certain businesses will expect to be operational by the time they arrive. The variety here is vast – laundromats, mall security, room service, and even wine tasting booths all serve a purpose once your block becomes jumbo-sized. Music recording companies, in particular, are an appropriately demanding client. Finding them a quiet corner for their studio is the least of your worries. Fail to keep clients satisfied and you’ll be left with a vacant lot. This is a bigger problem than it may initially seem. While there’s often a list of clients willing to set up shop, a small outlay is required first. That’s to say, you must spend money to make money. All it takes to end up in debt is a few bad decisions. Once in the red, no new construction can take place. All you can do is cross your fingers and hope a rent increase for existing businesses doesn’t cause a ruckus. There’s definitely a learning curve. Our first few attempts at construction and planning were disastrous, with funds running out by the time we reached the third floor. Mistakes were made – overestimating demand, overcharging rent, etc – but all experience is good experience, allowing us to put newfound planning skills to use on the next block. It wasn’t long until we had a tall tower boasting a multi-floored shopping mall, a food court, and a hotel with a spa. Building a skyscraper 100 stories high could be seen as the ultimate goal, giving something to focus on. Becoming the next Brian Potter and setting up an entertainment empire is undoubtedly the most exciting route, even giving the choice of which acts to book. But don’t expect to host gigs in a swanky new concert hall from the outset as a certain amount of prestige is required, gained only by growing a good reputation. You’re always forced to start from the bottom rung of the highrise hierarchy; there’s no skipping ahead to get to the more exciting stuff. You can, however, dabble in different challenge-based scenarios with already established towers. 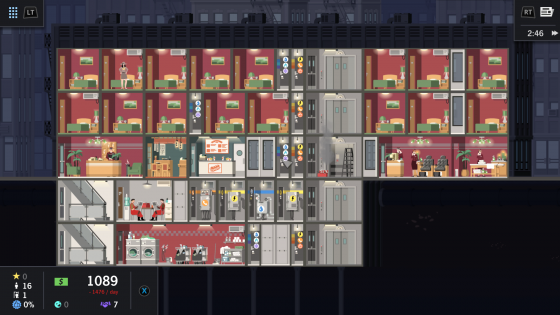 It should be clear by now that Project Highrise is something of a slow burner. This isn’t for those who want to build and build until their heart is content. It’s about starting off small and letting the cash flow in slowly. Moreover, it’s about planning, keeping track of expenses, and researching client’s expectations in advance. Getting out of debt is tricky and the fact that there’s no ‘game over’ screen seems an odd design decision – the game will merrily let you sit back and watch debt spiral out of control. It’s up to you to choose when to go back to the drawing board. In terms of presentation, this isn’t the most visually arresting of titles, but the minimalist art-deco visual style is pleasing enough. The interiors for each shop, service and department are different from one another, and there are dozens of variations of each. There isn’t much in the way of game modes, but that was perhaps to be expected – how much can you do with a tower block building sim? The UI is easy to navigate meanwhile, using a combo of easy to distinguish icons and text-based pop-ups. While the sedate pace and focus on advance planning makes Project Highrise hard to recommend to all and sundry, it’s still a welcome addition to the console market, leaps and bounds over many of the half-baked simulation games we saw during the last generation. With the surprisingly good Railway Empire and the long-running Tropico series under the belts, publisher Kalypso has really hit their stride with console-based simulators currently. Long may it continue.